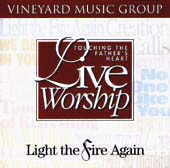 Light the Fire Again: Vineyard Music EXTRA! Eternity started its ministry life on this set. It has been included in no less than 5 other forms on other VMG sets. Light the Fire Again is one of Brian Doerksens best works. He also contributes Will You Worship? and Creation Calls. We Will Bow features the vocals of Karen Bease and Daphne Rademaker. It has become a worship staple at my church. Supernatural Love is a vocal exercise and is a joyful song of praise . Pour Out My Heart and Hail to the King are also highlights of many revival services nationwide. John Barnetts We Believe In You is absolutely awesome in this collection. No One Like You and Times of Refreshing are strong worship songs that round out this one of Vineyards best. Doug Martin <innercity@juno.com> is a Pastor in waiting and a reviewer for VMG and a Bible teacher in Louisville, KY USA.